There were three Post Office witnesses being cross-examined in court today. I have all their witness statements and will spend a very jolly couple of hours scanning and posting them up tonight. Forgive me if for the purposes of this report I focus on the latter witness. If you want to read what was said by Mrs Rimmer and Mr Breedon, please read my live tweets here. There's no doubt there were many people very keen to hear what Mrs van den Bogerd had to say under cross-examination. Over many years many aggrieved Subpostmasters have come to see her as chief executive Paula Vennells' representative on earth, defining the Post Office's position to them, and to the small circle of independent professionals who have been involved with investigating the Horizon system and subsequent mediation. This was established at the beginning of her evidence session during which she was asked if, much like Alan Bates has been campaigning on behalf of Subpostmasters for a long time, she has been involved in defending the Post Office's position with regard to matters relating to this litigation for a long time. She said she's been involved in investigating issues that arose out of Postmasters' concerns. The dashing Mr Green, QC for the claimants, asked Mrs van den Bogerd to confirm she was the Post Office's most senior representative involved in the trial. She agreed. How much Mrs van den Bogerd is her own woman and how much is operating under the advice or instruction of Paula Vennells, the Post Office board and Post Office's General Counsel will no doubt become clear eventually, but it's not at the moment. By way of example one of the first questions Mrs van den Bogerd was asked today was whether she was the author of a Post Office rebuttal document which was released after the Post Office had closed the mediation scheme and dismissed Second Sight in 2015. She said she wasn't the author, she had "input" into it. What we do know is that Mrs van den Bogerd has been here for the duration of the trial and she follows proceedings closely. The Post Office legal team have given her an iPad which allows her to see all the documents being discussed in court. I have no such access and have to request these documents retrospectively, and even then, there's no guarantee I'll get them. Around this point the judge asked Mrs van den Bogerd to slow down and speak up, which she did initially, and then became quieter and quieter as the hour progressed, which made things quite tough at times. Mr Green used his first hour with Mrs van den Bogerd to drill down into the difficulties a Subpostmaster faces when suspended due to anomalies at their branch. The Post Office asserts it is up to the Subpostmaster to ascertain the cause of discrepancies at their branch if they do not wish to be held liable for them. Mr Green highlighted the Post Office's assertion that lack of access to information after suspension had given rise to a prejudicial situation for a Subpostmaster. Mrs van den Bogerd was given a hypothetical example of a £9K discrepancy arising at a branch, which a Subpostmaster finds at 7.30pm at night. They call the helpline, but don't get a call back. the next day the branch is audited, the discrepancy is found and the Postmaster is suspended on the spot. They no longer have access to their Horizon terminal, so would Mrs van den Bogerd accept it is now very difficult to find out how the discrepancy arose. Mrs van den Bogerd accepted this hypothetical point, but said an audit would normally only take place if there were signs something was going wrong at a branch. Mr Green pushed Mrs van den Bogerd and suggested this could mean that it could mean that it could potentially prejudice a Subpostmaster. Potentially yes, came the response. The second issue Mr Green was interested in was the cost of the deal between the Post Office and potential Subpostmaster. The Post Office says their cash and stock is provided to the Postmaster at zero cost. The Postmaster invests in the lease for the building and the vost of the accompanying retail business, but the deal for the Subpostmaster is that there is no capital cost for them in being a Subpostmaster. Mrs van den Bogerd agreed. Mr Green then came up with another hypothetical situation. What if a Subpostmaster received a Transaction Correction in error, which required them to put £10,000 of their own money into the till or safe to balance. Now - four months down the line - the error is realised and a positive Transaction Correction comes down the line and the Postmaster can take the £10K back out. Mr Green made the point that the Postmaster was therefore providing their own working capital to make the business function. Mrs van den Bogerd had a lot of issues with this hypothetical situation, but accepted it could happen. During the course of this exchange Mrs van den Bogerd said something I couldn't quite catch and Mr Green jumped on it. "That's something the Postmaster would be expecting going into the contract - that the working capital would be provided by the Post Office" and you said "The Postmasters would be expecting going into that contract would be held accountable for any losses...."
Mr Green said that's the very point I've been trying to make today is that the Post Office doesn't make any distinction between losses for which they are liable, and any losses. It was quite a theatrical moment, but Mr Green was clearly keen to highlight it. He reiterated the point that his example was one for which the Postmaster was not liable, and yet during her answer Mrs van den Bogerd said the Postmaster was liable for all losses. He asked if Mrs van den Bogerd accepted that the Post Office habitually made no distinction between losses that Subpostmasters are contractually liable for and ANY losses. I honestly couldn't quite hear Mrs van den Bogerd's response to this, but I think she said if a Postmaster is not responsible for a loss, they will not be held liable for it. Mr Green developed his theory using the example of Post Office standard literature and letters sent to individual Subpostmasters which make it quite clear the Post Office is telling them they are definitely responsible for ANY losses incurred in their branch, when in fact they should be informing them that under the terms of their contract they are responsible for, "losses caused by their own negligence carelessness or error". He asked about the letter to Pam Stubbs (a lead claimant) telling her she is responsible for any losses in her branch and demanding she pay the Post Office £9,000. "That's wrong isn't it?" he said. Mrs van den Bogerd accepted it was wrong. Could Mrs van den Bogerd "explain to my Lordship", why this incorrect phrase kept turning up in Post Office literature? "Loose wording" said Mrs van den Bogerd. Mr Green suggested that the reason for the omission of the correct clause was because it made it far more likely that the Post Office would be able to take the money from the Postmaster it was being sent to. Mrs van den Bogerd disagreed. Strongly. No, she said, the Postmaster would have been perfectly aware of their contractual responsibilities and could dispute it. Mr Green brought up the Pam Stubbs letters. The first of which in early February 2011 was an email from a Post Office manager, telling her she would not be held liable for any debt whilst her situation was being investigated. Then he drew her attention to another letter written three days later saying Mrs Stubbs was liable for ANY losses in her branch, demanding £9K and then asking her to get her credit card and call the debt recovery team. Mrs van den Bogerd said these are automated processes and that nothing had been put in the system by Post Office management about stopping Mrs Stubbs' debt demand letter being sent out. Mr Green put the issue to Mrs van den Bogerd again. He said the letter in the way it is written, is a mis-statement of her contractual obligations and a demand for money which makes it more likely that the Subpostmaster will hand over their own money to cover the discrepnacy. Mrs van den Bogerd said it was not a deliberate. It was a mistake. The judge is not clear. He wants clarification from Mrs van den Bogerd. Does she accept the statement of contractual obligation was a mis-statement? Yes she does. Mr Green is then asked by the judge to ask his next question again - does Mrs van den Bogerd accept that the way it is stated is more like to get money out of the Subpostmaster? Or that if the contractual obligation were stated in precise terms, it wouldn't make any difference? I think Mrs van den Bogerd said here that in this case [I couldn't really hear her precisely] no it wouldn't because in Pam Stubbs was disputing her discrepancy and she would have expected her to have had some kind of conversation with her manager about it so she knew what she needed to know. Mr Green takes her to a letter to Pam Stubbs dated March 2011, still demanding money. Mr Green asks why this letter has been sent when the author of the email telling Mrs Stubbs he was going to suspend her liability while an investigation is going on has now sent two letters demanding repayment. "It's a mistake." says Mrs van den Bogerd "I know how they work." And that was it from Mrs van den Bogerd. Other interesting bites from today included Mr Green either making a point he was always going to make or picking up on something from Naushad Abdulla's evidence when speaking to Mrs Rimmer. In the summary of terms sent to Postmasters which they sign and return after being offered the job (they say in lieu of seeing a contract, the Post Office say along with the full 114 page contract), Mr Abdulla pointed out a note saying that none of these terms can be relied on for any purpose. Today Mr Green noted a clause which said "“for use as as guide only. POL will in no way held responsible for action taken as a result of this summary." With John Breedon Mr Green hammered the point about the misquoting of section 12:12 to occlude the clause "negligence, carelessness or error" and again going hard on the lack of access to information about their suspension that a Subpostmaster has compared to the Post Office, both in terms of why they have been suspended and investigating what might have caused discrepancies in branches (both pre- and post-suspension). Mr Green also raised a very interesting point with Mr Breedon from an internal Post Office guidance document when discussing whether or not to suspend someone. The last point to weigh up is their "willingness to make good the loss", suggesting that if a Subpostmaster was disputing a discrepancy as not their liability, it militated against them in the decision whether or not to suspend them. So there you have it. Key points as discussed today. For the full blow-by-blow read the live tweets post. We are going to reconvene tomorrow at 10.30am for more evidence from Mrs van den Bogerd. I will attempt to sit closer to her so I can hear more of what she says. If you are enjoying these reports and updates please do chuck some money in the tip jar. Whilst I am trying to work out how to get to court for the #postofficetrial, please do buy today's @DailyMailUK - on p10 there is a piece about Seema Morra whose husband first got me interested in this story 8 years ago. Spent the last two hours collecting the car, driving 13 miles from Walton to Wimbledon, parking, and am now on the Milk Float line to Temple after which there will be a short uphill sprint to the Rolls Building. I suspect I will miss an hour of proceedings. Needless to say I am quite stressed right now and would like to apologise to all who were expecting live tweets to start at 10.30am today. Please direct any ire at @SW_help and their inability to finish their engineering works on time. Okay I’m in court 26 at the Rolls Building. Mr Patrick Green QC, for the claimants is speaking to a blonde woman from the Post Office, who I believe might be Helen Dickinson (I have just snuck in so I have no idea). Let the live tweets commence…. JFSA QC taking her over her witness statement. She’s from the Agent Application Process Team. She says in her WS “applicants often get external support from … accountants and lawyers." QC makes the point that applicants can’t get advice on things they don’t know about yet. HD (if it is she) agrees. QC says applicant SPMRs tend to get advice from accountants on their business plan. HD WS says she would not typically liaise with the applicant SPMR’s solicitors, but they do what they can to smooth the process. HD notes NT contracts makes a specific point of advising SPMRs to get legal advice. QC asks why it wasn’t in previous contract. QC asks how many applicants take advice. HD aware that some do do that. Mr Green does not push her for a figure or percentage. and the outgoing SPM has a responsibility to hand over a lot of information to the incoming SPM. QC asking about the websites which help SPMs with applications and finding new businesses. This phrase tickles the judge who interjects to note how dated the allusion is. but the point is the outgoing SPM is always going to talk up his PO to an incoming PO. So QC and HD agrees that when HD says in her witness statement there is an expectation an outgoing SPM will inform an incoming SPM about the branch, it’s about products and services, not contractual liabilities. QC also makes the point that PO is not contractually bound by whatever the outgoing SPM says to the incoming SPM. QC points out summary of terms sent to incoming SPMs which they sign and return contains clauses such as “for use as as guide only. POL will in no way held responsible for action taken as a result of this summary." also in same doc “note the above pars summarize certain sections only of the SPMC… a SPM may not rely on” the terms within. It is not Helen Dickinson in the box it is Mrs Sarah Rimmer. Apologies to HD for getting that wrong. We are taking a ten minute break. Mrs Rimmer will return to the box afterwards. No we won’t! Mr Green QC stands up after the break and tho Mrs Rimmer has been in the box all break, he has no further questionss for Mrs Rimmer. There is no re-examination by the PO QC so we now have John Breedon from the Post Office. Mr Breedon has been sworn in. I will hopefully get his Witness Statement soon. Mr Breedon is wearing a white shirt, dark great suit and light/dark candy-striped tie. He has grey, thinning hair. JFSA QC is on his feet. QC is talking about interview notes using voice recordings. Doc notes that from 08 contract advisors will record SPM applicant interviews. Do you remember that? JB doesn’t, he thought it was 2006. JB accepts he was mistaken. QC say both NTC and SPMC allow PO to terminate an SPMR - QC asks if the provisions are materially different? QC moves onto another doc - which says an SPMR may be suspended at any time if PO considers it desirable, possibly cos s/he’s been arrested, or charged with an offence, civil proceedings being brought or there is a suspicion accounts have been misrepresented, SPM is insolvent.. The QC points out that NTC and SPMC have key differences. NTC where the PO considers it to be “necessary” and SPMC says “desirable”. QC says this essentially materially different, but does it in reality operate like that? Or does PO do what it wants to do as it sees fit. JB says his interpretation is that the difference in the contracts in this case is not material to the way the PO operates. JB not sure what you mean. JB v serious for both parties. PO takes suspension v seriously. QC there’s also a serious stigma to being suspended? … you’d take that into account. QC and in order to have the whole picture you’d have to investigate, wouldn’t you? JB demurs a little - says it depends what has happened. QC and a suspension affects their revenue? QC discussion about what negotiating position the SPM is in when it comes to accepting a temp. JB agrees with all the latter points except about the ARQ logs which he doesn’t know whether they do or don’t. QC quoting 12:12 of SPMC about losses caused by negligence, carelessness or error. and now quoting another document saying SPMC is required to make good all losses no matter howsoever they occur. That’s not correct, is it? JB in the context of 12:12, no. … the issues in this case. QC shows a standard form letter which also asks PO staff to remind SPMs that they should make good all losses. JB agrees it is not correct in the context or 12:12. … on several occasions the need to make good all losses whatever their cause and it is only after several letters the SPM is told they have to make good losses caused by negligence, carelessness or error. JB says he might have been aware of this but no conscious of it. JB adds that he doesn’t think anyone was trying to do anything untoward. QC takes us through the sequence of letters sent to Pam Stubbs. QC first one is a demand for losses based on her responsibilities to cover all losses. Does he accept this is how it reads? QC notes the reply PS gets from the PO saying she will have her debt investigated and that her debt will be put on hold. QC then raises the next letter PS gets from the PO two weeks later which is another demand for money. correction - 4 days after, not two weeks. QC asks if this is a “postal instruction” that PS must comply with. JB agrees. QC notes the letter is from the same person who said he would put PS’s debts on hold whilst the investigation was ongoing. …. and asks if it’s surprising that she would find it distressing. JB agrees it might well be distressing. QC asking if an investigation should cover any factor which could have caused an error should be checked. JB says he’s out of his comfort zone here. QC rephrases. Shouldn’t everything be checked whatever the cause? QC says and SPMs don’t know everything that is going on at PO. That’s why they’re asking for an investigation. QC asks if it is reasonable to explain to an SPM in writing why they are being suspended. QC quotes from a letter which says PO is considering a summary termination in view of outstanding terms. … it’s reasonable for them to ask. And PS did ask the PO for help through the helpline and got marked low priority. Why? JB don’t know - don’t know how helpline prioritises calls. … or repaid from remuneration over 12 months. And that’s not right is it? QC but that’s what everyone is working to at Post Office, isn’t it? The SPM has no way of finding out how losses might arise or any way of disputing them. QC They don’t - they can settle to cash or settle centrally - ie accept the debt. JB and then dispute it. JB yes this allows the PO to know what the sum involved is, which might be settled by a TC. Judge asks if it makes any difference to any investigation whether or not the PO perceives the discrepancy as a debt or a discrepancy. Judge that’s what I thought. Now we are on to how the PO decides to suspend a SPM. A field support advisor (auditor? ), calls a contract support advisor and the advisor makes a decision to precautionary suspend someone. This is a judgement call by a contract advisor often discussed with other CAs (inc JB). If misuse of funds or stock is admitted suspension is automatic. Amount is irrelevant. This is under review. QC do you remember this? QC but if the next morning than money isn’t in the till because the SPM doesn’t have the cash..
… or a cheque that they want to put in, there’s going to be a discrepancy. QC is there then a discrepancy that could lead to suspension? QC goes through all the things a CA has to weigh up before a suspension decision. … could be a factor in their suspension? JB it might have been when that document was active. I don’t think that is the practice now. QC also notes document which says “if there is any doubt, suspend” and then there’s a star there which says “under review”. Is that still the situation? … information supplied by the CA. QC If decision is made not to suspend the CA must draft a document and justify their decision. QC notes june document which shows 193 suspensions in April 2010 to end March 2011. FOI shows of the 193 - 54 wer reinstated. …. 48 resigned to avoid summary termination. QC a lot of reinstatements there. CA on receipt of audit advice and other documents decides on suspension and writes to SPM to advise reasons for suspension and invite SPM to interview. QC is it not practice to discuss the SPMs case between CAs before doing so? JB don’t understand the question. QC okay. goes back to hypothetical scenario. £1000 missing from till. SPM suspended after discussion between the suditor and the CA. But the SPM is not told why then. QC would you renumerate them for the income the have lost? JB in the circs where we have got it wrong in the light of info coming to light during our investigation yes we would repay them. We do get things wrong, we’re only human. We’re back still talking to Mr Breedon from the PO about remuneration payments for suspended SPMRs who were suspended in error. looking at a Guiding Principles document for remuneration. GP says SPMR should not receive any remuneration for product pay. QC But the GP here says the remuneration repayment should only be made if the PO has acted “unreasonably”, whereas you said you would act fairly to the SPMR if you were wrong. Do you know this document? … document says you should in practice? QC what is the proper thing to do? … really he should go by the latter. QC draws attention to Mr Abdulla’s suspension letter (lead claimant) and says it doesn’t give any reason for his suspension. Which contradicts what you told me is the correct practice. QC But that contradicts what you said in court this morning. QC Let’s have a look at Pam Stubbs suspension letter. It doesn’t mention why she has been suspended. Nothing about the allegations against her. … would have been made. … writing so that when someone who has gone through the traumatic experience of being suspended has it spelled out. And that is not happening is it? JB No but it does normally and explains how it would happen. … the way the suspension process works under NTC and SPMC. JB says an SPMR wouldn’t normally get reasons for suspension under OLD contract until they get a “reasons to urge” letter of invitation to interview to discuss charges against them. QC notes there is an important point of natural justice that people accused of something should know what it is. Basically the ruling raises issues of fairness in the Post Office’s contract. then reads a letter from PS in which she complains that she is being told it is only her or her…. QC lists what it could be - faults in H, client/data integrity issues, human error at the PO end. QC How long have you been in your job? actually - PO has made the point there is no evidence that lack of access to the information has prejudiced any trial. … and the SPMR can’t get at it. JB accepts what the QC is saying. QC is it acceptable to have to wait for criminal or civil lawyers to get involved? JB speaking personally , no. Sorry I’m going to have to reboot. Computer is going slow again. QC talking about 26 month compensation payment when the PO takes the decision to close down a PO branch. … notes proposal that outgoing SPMRs should receive 28 months remuneration to compensate urban SPMs leaving the business. QC says when someone resigns, you try to achieve a smooth outcome from the transfer from outgoing to incoming SPMR..? QC talking about handover dates and how the PO can delay handover if not ready, and reasons they may not be ready is sudden departure of previous SPMR. QC now talking about Mohammad Sabir [another lead claimant] taking over his PO. QC although the SPMR can give 3 months notice the reality is to pass it on to someone else they have to wait for the PO to organise a transfer date. QC now raising speed at which Liz Stockdale was appointed and complaint letter by LS’s predecessory that it’s taken a minimum of 6 months to effect a changeover. QC points out both LS predecessor and LS are keen to effect the changeover of the branch, yet the PO is dragging its heels long after LS’s predecessor has given her notice. … period when 7,000 branches were being changed. QC goes back to termination clauses in contracts. JB explains in the old days - contract advisor (CA) would terminate or reinstate. if terminate, there would be a 10 day appeal period, that would go to a senior PO manager who had no previous involvement in the case. PO manager would go through the CA investigation to make their decision. … was removed. Now if CA decides to terminate, that is ratified by their line manager. So there is still a two tier decision in place. JB the CA would have had a conversation with the SPMR as part of their investigation so it would be fair before they make the final recommendation. QC we are now on to “Corrective Action” against SPMs failing to meet standards of performance. QC and SPMs can expect reasonable help from the PO with that. QC unless people are trained how to do it, there’s no way of them being able to perform their job properly. QC talks about training - managing cash and stock, dealing with problems. These are all fair expectations from PO and to SPM. 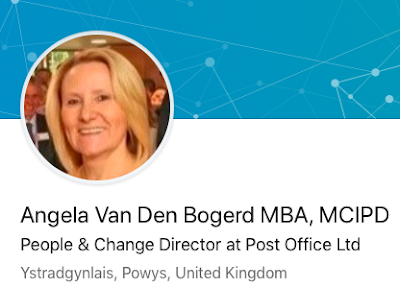 10 minute break, then QC will finish with Mr Breedon and I suspect we will have Angela van den Bogerd, People and Change Director of the Post Office in the witness box for the last hour of today and all day tomorrow. Ms vdB will be the most senior Post Office employee to be cross-examined in this trial. back after a 10 minute break. No further xe from Mr Green. Now PO QC Mr Cavender on his feet for re-examination. Asking about a transcript point. POQC to your mind has this doc been sent by Paul Kellet? QC would that mark between his name and the end of the letter mean anything? PO QC is this [refers to doc] a reasons to urge letter? PO QC what’s it for? PO QC if someone said there might be an IT reason for a shortfall what would you do? PO QC what if there was a persistent failure to meet standards - could you use your 3 month termination power there? PO QC is this post suspension? PO QC and would they be able to receive representations from the SPM? Judge - could they interrogate branch data and [back end] data which they could interrogate? Judge why does the Post Office refer to itself without the definite article? I have been trying to find out for quite some time. PO QC stands up and says it might be a copyright. if you are The Post Office you might lose it, if you are Post Office you are protected. Judge - that’s the first logical answer I have heard to date. Angela van den Bogerd has been sworn in. I have been given her witness statement. AB is People Services Director for Post Office. Angela has a blond bob and is wearing glasses in the witness box to see the screen. PO QC currently taking her through elements of her witness statement. Judge has asked AB to speak more slowly. JFSA QC you have been defending Post office’s position in matters relating to this litigation for some time. AB tells court she is now Business Development director at Post Office. QC asks about Second Sight’s contraction to get involved in complaint scheme. So SS were contracted by PO at behest of MPs. Sorry this is about branch support programme which came about as a result of SS’s interim report. AB I had input. I don’t think I signed it. QC response to issue raised - no evidence exists to say that the removal of information has prejudiced any case. Would you agree with Mr Breedon that it’s hard for an SPM to defend themselves without access to information. QC so that would make it difficult for them to prepare for a reasons to urge meeting? QC they don’t get a call back, they are then suspended, and now they can’t find out. AB no - but - if there is an audit - it is because there is something looks like its gone awry. AB so it would be very rare. QC and PO published a final document which it saw as the end of the affair. QC and another point was that you felt SS hadn’t understood relationship…. … as one of agent/principal. … SPMR needs nothing other than their wider investments. QC so when you say no investment, you’re only talking about cash and stock. AB yes - we provide it and that is the property of the PO. QC that’s the expectation. PO provides working capital, PO provides assistants and a premises to use it in. QC let’s take the example of a TC given in error. £10000. SPM has to pay it in cash or cheque, or settle it centrally. Yes? QC consider an example of a TC issued incorrectly. They put money into the till to make it good and then 4 months later a correction comes down. If tha’ts a substantial sum of money, the SPM has been required to provide working capital for branch trading. QC but you know corrective TCs are a thing? … something that a SPM might be expecting. AB the SPM would expect to be held accountable for any losses. QC Do you want to go back and have a look at what you’ve just said? QC takes her back to what she said. I think this underlines my point that the PO does not make a distinction between losses that are and aren’t the SPMs fault. QC do you accept that the PO habitually makes no distinction between losses that SPMRs are contractually liable for an any losses? AB if they are not at fault they would not be held liable. sorry this is 20 nov 1998 version of a guidance doc on p24 - "from a purely contractual perspective" the SPM is responsible for all losses caused by negligence, carelessness or error or n, c, e caused by assistants. QC why “purely”? to distinguish contract from actual practice? AB gives her reading of it. QC asks why in another document there is a distinction later between all losses or all losses caused by negligence or error… it’s wrong isn’t it? … since you are contractually obliged to make good “any losses”. It’s wrong isnt’ it? … have been aware of what their contract said, so they could have disputed it if they wanted to. QC have a look at your last answer. AB asks to look at Pam Stubbs letter chain. QC takes her to agreement o put PS debt on hold, then the next letter demanding the money. AB says a number of these letters are automatically generated so the second letter sent out in Paul Kellet’s name is sent by one of his team. He hadn’t updated the system before the second letter went out. QC asks if PO is more likely to recover debt if they don’t fully quote the full terms of their contractual liabilities. AB no. SPM would be aware of their ability to dispute. The letter is a mistake. The wording is loose, I accept that. Judge so you are saying it mis-states the SPMs’ responsibility wrt to their contract. … that by framing it in this manner it is designed to get the money from the individual. QC let’s look at the letter chasing PS debt again the one in March. Are you still saying that after agreeing to suspend the debt pending an investigation the system has not been updated a month later. AB yes. I know how they work. it is a mistake. We have finished AvdB’s evidence for the day. We resume at 10.30am tomorrow. 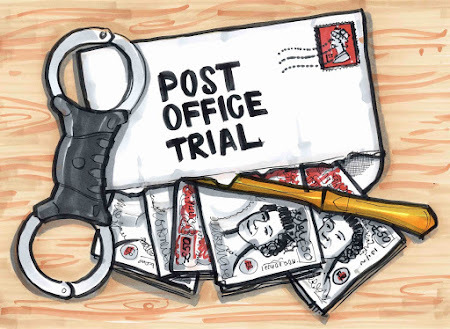 These tweets will be posted up (formatted for easier reading) on postofficetrial.com within the hour. Full write up before 9.30pm tonight. Remember all tweets re the back and forths in the trial are paraphrases unless directly quoted.